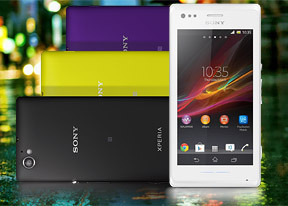 The Sony Xperia M comes with the custom Sony gallery, called Album. Images are organized into groups of thumbnails and sorted by date. Pictures is the main tab and one of its features managed to impress us: you can make the image thumbnails bigger or smaller, either with a pinch gesture or a sideways swipe. The whole thing is very responsive and hundreds of thumbs fall in and out of differently sized grids in a nifty animation. There is a second tab here, My Albums, which includes online albums (PlayMemories, Facebook, Picasa) along with albums stored on devices in the local network. Also here are some special albums - Maps and Globe, which use the geo-tagging info to display photos where they were taken, and faces, which groups photos by the faces of the people in them. Images can be cropped or rotated directly in the gallery. Quick sharing via Picasa, Email apps, Facebook, Bluetooth or MMS is also enabled. There's a slide show using the SensMe brand and much like the music player feature, this one scans files and groups similar photos together. Finally, the LED strip below the display lights up with different color (similar with the image on the screen) every time you scroll through the pictures. The video player is dubbed Movies and it too has a great custom UI, reminiscent of HTPC interfaces. It's connected to Gracenote, which helps you find additional information about the movies and TVs you have on the phone. It will even download posters for them and for movies, it will download metadata like genre, synopsis, director and cast. Unfortunately, the video player's capabilities are pretty poor. It refused to play any 1080p videos and 720p DivX/XviD were also a no-go. 720p MKV files did work, but there's no DTS or AC3 support (which is what most MKV files have). There are as many sound enhancements here as there are for the music player, but with no support for high-quality audio codecs, it's wasted. There's no subtitle support either. You can download a more capable app from the Play Store, but then you lose the Gracenote features - the Movies app always plays videos (or tries to, anyway) with its own player rather than what you've set as system default. We tried BS Player and it worked, but 1080p videos were choppy (in software decoding mode, hardware decoding failed). 720p videos worked okay, but the sound issue persisted. The Walkman music player, which we first saw on the late-2012 Sony Xperia smartphones is also on board. It offers the same cool interface as before, but this time it has more options for sound enhancement. The Walkman is divided into Playing and My music panels. In the My music section, you can update your album art and music information like album, year released, and more. SensMe is included, meaning you can filter your songs by mood - upbeat, energetic, mellow, dance, etc. Creating playlists is enabled and you can also view your Facebook friends' activity if they too use the Walkman player. The Now Playing screen offers the standard music controls, shortcuts to the library, "Infinity" key and the song cover art. The Infinity key lets you quickly look up a song on YouTube or browse for the lyrics, among others. Sony has improved on the Walkman player's settings. There's a new ClearAudio+ option, which determines the best audio quality settings depending on the song you're listening to. We liked how it changed the music. There's Surround sound mode, which imitates the Studio, Club or Concert Hall experience. The Clear stereo mode enhances the perceivable stereo channel separation. Dynamic normalizer minimizes the difference in volume between songs (great if you're playing a shuffled mix). Speaker settings include Clear Phase, which adjusts the quality, while xLOUD enhances the loudness of the internal speaker. And audio fans will be pleased as there is a configurable 5-band equalizer with bass adjustment. However dedicated audiophiles might want to consider alternatives off the Play Store, with support for a 10 or even 20-band equalizer. There are music controls on the lockscreen. Swiping them to either side brings back the clock. The notification area also offers the now playing screen with music controls and the option to jump into the Walkman player. The RGB notification light below the screen will change to match the album art of the currently playing song (you can disable this if you don't like it). Google's own music player called Play Music is on board as well. It features the Listen Now feature, which tries to determine what you like and the sequence of your track-changing so that it can start offering you music you might like to play next. The Now Playing screen uses the song album art and gives you a quick shortcut to the rest of the artist's songs along with the play controls. The Sony Xperia M also features an FM Radio aboard complete with RDS support. The app features multiple visualizations and integrates with TrackID to recognize the currently playing song. You can even directly send an "I'm listening to..." post to Facebook. Disappointedly, we found that one of the visualizations and TrackID crash the whole phone from time to time. The Sony Xperia M performed excellently in the first part of our traditional audio quality test posting some great scores in all parts. Unfortunately its volume levels are well below average, which prevents us from giving it full points. 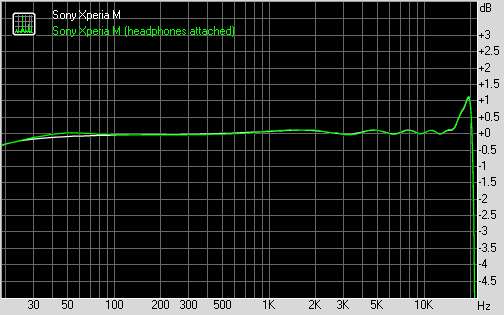 There's very little degradation when you plug in a pair of headphones. Except for the slightly worsened stereo crosstalk, the added resitance to the line out has virtually no impact. Volume levels remain pretty low, though, so while the overall output is one of the cleanest we have seen, it's not quite the perfect showing by the Xperia M.